Lanxess (Leverkusen, Germany) is building the world’s largest plant for EPDM synthetic rubber in China. Among other applications, EPDM is used as an impact modifier for resins such as polypropylene, where it competes with polyolefin elastomers such as Tafmer from Mitsui Chemicals (Tokyo) and Engage from Dow Chemical (Midland, MI). The German specialty chemicals company is investing EUR235 million in the plant in Changzhou (Jiangsu Province). This is the largest investment the company has made in China to date. The plant will have a capacity of 160,000 tonnes/year and is expected to start up 2015. Lanxess is the world’s leading supplier of EPDM (ethylene propylene diene monomer) following the successful acquisition and integration of DSM Elastomers in 2011. It markets its products under the brand name Keltan. Global demand for EPDM is expected to increase by more than four percent per annum in the coming years, while demand in China is expected to grow by around eight percent, driven above all by automotive and construction industries. China will also continue to be the largest net importer of EPDM in the coming years. “We are strengthening our global EPDM asset base with a world-scale plant in China to serve our local customers even quicker with premium products,” said Lanxess CEO Axel C. Heitmann at the plant’s groundbreaking ceremony. “This plant also represents our company’s third major rubber investment in Asia and strengthens our credentials as the world’s leading provider of synthetic rubber,” added Heitmann. The new EPDM plant will be located at the Changzhou Yangtze Riverside Industrial Park, with access to storage and ship uploading facilities. Lanxess will be supplied the key raw materials ethylene and propylene from a methanol-to-olefins (MTO) plant currently under construction at the site. The MTO process is a new way to produce these key raw materials, which are conventionally produced from refineries. 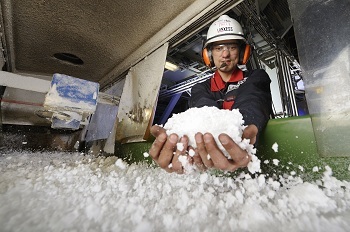 Lanxess will use Keltan ACE technology to enable sustainable production at its new plant. In comparison to conventional technology, the Keltan ACE catalyst technology reduces energy requirements for production and it does not require catalyst extraction as a result of high catalyst efficiency. Furthermore, the process enables the manufacture of new EPDM rubber grades, such as oil-extended EPDM and special high molecular weight EPDM. The new plant will produce in total ten grades of EPDM tailored to Chinese customer needs. Lanxess already operates EPDM production sites in Geleen, the Netherlands, Marl, Germany, Orange, USA and Triunfo, Brazil, with a combined capacity of 320,000 tonnes/year. Lanxess plans to convert 50 percent of its total production capacity at the Geleen site to Keltan ACE technology in 2013. EPDM is used primarily in the automotive industry in door sealants or windscreen wipers. According to Lanxess estimates, approximately seven kilograms of EPDM is used in every car. The product is also used in the plastics modification, cable and wire, construction and oil additives industries. Its properties include very low density, good resistance to heat, oxidation, chemicals and weathering as well as good electrical insulation properties. Since the end of last year, Lanxess has been commercially producing EPDM from bio-based ethylene and marketing it under the brand Keltan Eco. Lanxess is using ethylene supplied by Braskem S.A. (São Paulo, Brazil) In comparison to petroleum-based ethylene, Braskem’s ethylene is produced by dehydrating ethanol from sugar cane. Lanxess held its first-ever “Mobility Day” in Shanghai on September 6. Under the motto “Sustainable Technologies for China’s Future”, the company showcased its latest products geared towards “Green Mobility.” Around 400 participants from industry, academia and associations exchanged ideas and discussed topics including lightweight plastics and battery technology.